Leopoldstrasse is the main street of the former artists' quarter Schwabing. The street between Münchener Freiheit and Victory Gate is nowadays the promenade of Munich people, a place to see and to be seen. 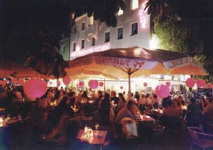 47 open air cafés and restaurants along the street invite you to sit outdoors. Sit down, watch the people and enjoy the Schwabing atmosphere. 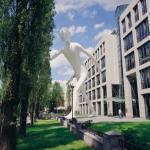 The area around Leopoldstrasse is also in the cold season a place of entertainment. In the side streets east of Münchener Freiheit (Occam-, Feilitzsch-, Sieges-, Marktstrasse) a amusement quarter with more than 30 pubs and bars is located - some with live music.